We manage over 25 private yachts ranging between 10ft to 300ft length both sailing and motor. We specialise in crewed yachts charters, but can offer bareboat charters for our sailing boats as well. At Isabella Yachts we like to take the best care of our guests providing all the necessary services available, that is why most of our trips come with our special all inclusive package. Please contact our Team ( [email protected] ) for any specific requests or custom made packages - Let us plan your unforgettable boat trip in Phuket! Isabella Yachts, has been established in Phuket since 2012 specializing in crewed and bareboat charters for day/weekly trips around the islands in Thailand and Myanmar. With a team of over 10 people, working full time, and based in Phuket all year round, we can provide 24/7 assistance and are always there to help. We speak English, Italian, Spanish, French and Thai. Ask us any information about routes or the available boats for charter. Visit our Tripadvisor and social media channels. Isabella was born in Lugano Switzerland and has been visiting Phuket yearly since 2007. 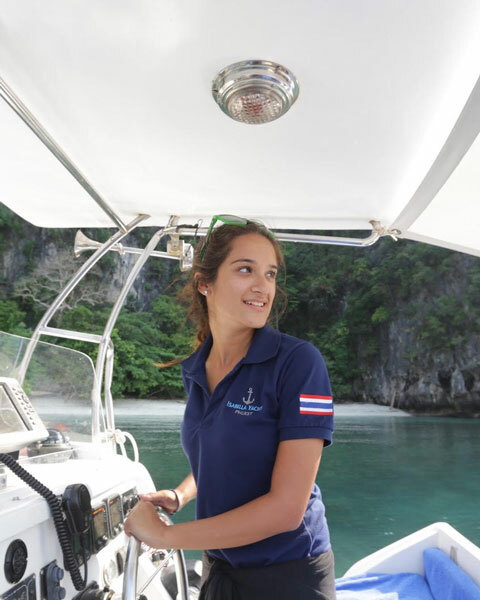 This island obsession made her leave rainy London in 2012 and move permanently to Phuket to start Isabella Yachts. With a double passport: Swiss and Italian, she can speak fluent Italian, English, Spanish and some French and Thai too. She studied all her life in international schools and finished with honors her master degree in media communication & management from Webster University London. Isabella has been going to Sardinia Island in Italy every summer since she was 3 weeks old. She belongs to the sea, the islands and has always been around boats. In 2010 she got her international boat license; she can cruise sailing or motor boats up to 24mt length anywhere. She has sailed around Italy, Croatia, France, Corsica, Spain, Greece, BVI's and Caribbean's before discovering Thailand where she started chartering both sailing and motor yachts for daily or weekly cruises. "Thailand is the only place where you can enjoy sailing in warm weather all year round!" This is what made her believe in Phuket to start her successful business. Born and educated in Milan, Italy, Alex joins the dynamic team with a wealth of charter experience. 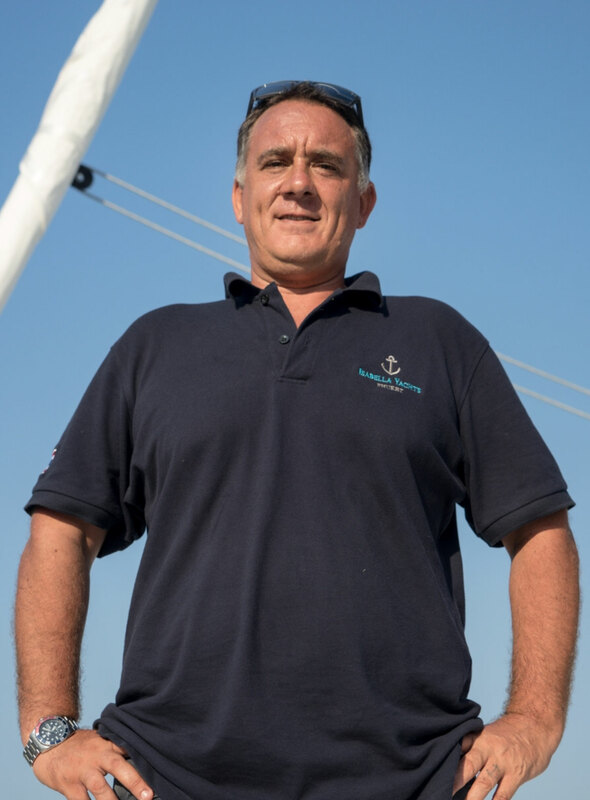 Over the years, he has worked and managed charters in Australia, California, Spain, Maldives and Myanmar. He has been living in Thailand for the past 6 years and before that, he was the Captain of a motor yacht Azimut 55ft based in the undiscovered Mergui Archipelago in Myanmar. You might have known him as Simpson Marine Phuket ex Charter Manager where he was managing several lagoon catamarans in their fleet. Not only a motor yacht captain but an avid sailor, Alex has great knowledge about Lagoons and has a 500 GT Master. Having also managed his own charter business previously in Italy and Maldives, he is equipped to understand the needs of all charter guests in order to provide full enjoyment of their destination holiday. Alex is fluent in Italian, English and Spanish. Born and educated in Phuket, Thailand, Vii has been part of our charter management team since almost one year. She is a Thai national and studied in international English schools all her life therefore is fluent in both English and Thai. She regularly goes on board day trips and knows everything about all our boats and destinations. Friendly, proactive and a real treasure when in need of someone to talk to the locals around the islands. A Webster University degree combined with local knowledge, Miss Vii is the person you want to be in touch with when planning logistics for your trip or simply to know the best spots to not miss during your trip!